Nothing is better than relaxing in a hot tub after a long day of work. At least, that might be what you think. But relaxing is only one advantage in the huge list of benefits hot tubs offer. Do you want healthy hair? Glowing skin? To lose weight? A hot tub helps with all those goals. Interested in learning how? Read on to discover 15 of the coolest health benefits of hot tubs. If you have a medical condition, speak to your doctor before hopping into the hot tub. While quick forays are usually fine, some conditions can worsen due to the extreme temperature. A doctor will recommend the amount of time you should spend in the hot tub. Likewise, even healthy individuals should avoid staying in the hot tub for too long. While the health benefits are numerous in nature, staying in the warm water for extended periods may cause you to overheat. With that being said, avoid falling into the trap of assuming hot tubs are dangerous. Adverse health effects are extremely rare, and the common myth that anyone with hypertension or heart issues can’t enjoy a hot tub is false. Studies show individuals can stay in the warm bubbles for 10 minutes with little or no effects on their blood pressure, and even individuals with heart issues can enjoy the warmth for small periods. Always drink lots of water to stay hydrated, speak to your doctor about any health conditions and avoid alcohol before soaking if you worry about adverse effects. If you keep these small facts in mind, you’ll find the benefits far outweigh these small measures. That soothing warm water actually releases endorphins. Yes, those are the chemicals that make you happy. CHECK OUT A WIDE RANGE OF HOT TUBS HERE! When we submerge in warm water, it increases the circulation in our skin, encouraging endorphins. It also improves breathing because of the water’s pressure. Deep breathing increases oxygen levels throughout the body and stimulates the nervous system, which encourages feelings of calm. This comes with a whole bunch of beneficial health effects, including reducing stress. According to the American Institute of Stress, deep breathing for half an hour a day reduces anxiety. If you want to add to the relaxation even more, throw in some calming bath salts. Just be sure you choose ones appropriate for your hot tub! According to the CDC, 23% of adults in America have arthritis. Arthritis can lead to aching, painful joints. Hot tubs come to the rescue here, too. Warm water therapy has been used in various forms for centuries, and it still stands up to research today. A hot tub’s warm water loosens the joints by providing 360-degree support for limbs, taking the weight off the sore joints. Studies indicate it takes only 20 minutes to receive the full effects of warm water therapy on arthritis. Keep your hot tub’s temperature between 92 and 100 degrees Fahrenheit for maximum effects. While you’re in there, consider some stretches or basic exercises. Research indicates you can minimize the pain from arthritis by up to 40% by doing this two to three times a week. Hot tubs also increase circulation. The water’s heat opens the blood vessels, allowing blood to circulate more freely. It even promotes cell growth and blood pressure. You get the memo. The past few decades have seen more patients suffering from symptoms of toxicity: hormone imbalances, obesity, fatigue and more. These symptoms are linked to chronic issues, such as cancer, that can lead to complications down the road. Jumping in your hot tub encourages the detoxification process. The warm water stimulates detoxification through lymphatic flow. The lymphatic system is a network that rids the body of toxins. If the warm water wasn’t enough to clean your skin of dirt and grime, it also boosts this system and causes you to sweat, contributing to detoxification. The result is a “fresh” you with fewer toxins than you had before. This means the likelihood of experiencing a toxic symptom (which leads to further complications) greatly diminishes. We all want that shiny hair the models have in the commercials. You know the ones: they twirl and their hair looks magical. Hot tubs might help you here, too. Hot tubs reduce oil production. Oil production leads to greasy hair and itchy scalps. In producing less oil, your hair is rejuvenated and retains the glossiness we all want. But your hair isn’t the only thing that feels the hot tub’s effects. The water’s heat causes us to sweat, which (as we’ve discussed) rids our body of toxins. However, this has another benefit: healthier skin. Those toxins that cause pimples and other blemishes are released from your pores. This process only works with mild or moderate sweating, which is exactly what a hot tub induces. The very thing we love about hot tubs (the warmth) is also the element that lets us sleep better. Studies show if you take a warm bath before bed, you’ll experience a restful slumber and fall asleep quicker. When we leave the warmth of a hot tub, our body temperature drops as we interact with the cooler environment. Our bodies immediately respond to this by slowing down our heart rates, digestion, and other metabolic functions. This signals the brain that it is time for sleep. All it takes is five to 15 minutes in the hot tub for a night of good shut-eye. About 80% of Americans will experience extended lower back pain at some point in their lives. It’s also the leading cause of missed work in the US. But if you have a hot tub, your back reaps the benefits. The heat relaxes the muscles, which minimizes muscle spasms. The increased circulation we discussed earlier also gives your body access to the injured muscles, permitting faster healing. The jets stimulate muscle relaxation just as a massage does. Between these two features, studies have found spa therapy leads to better mobility and less pain than medication. Don Benedict, who played handball competitively, experienced the benefits warm water can offer the back. After undergoing three surgeries, his spinal cord nerves became compressed. He was in constant pain. Benedict’s solution was simple: he now visits a hot spring three times a week. The results are amazing. Benedict told CNN the water reduces and sometimes eliminates his pain for six to eight hours. But you don’t have to go to a hot spring to enjoy these benefits. Just get a hot tub! Want to kick those colds you get each year far, far away? A hot tub may be the answer. Studies indicate hot baths cause inflammatory responses similar to exercising, which helps protect us from illness. Furthermore, elevated body temperatures increase certain immune cells’ activity, allowing your immune system to work better. As you may have guessed, this is why we experience fevers when we are ill. The particular cells that are elevated destroy virus-infected cells and tumor cells. Coupled with the hot water’s ability to rid the skin of dirt and promote detoxification, your body experiences a one-up against those nasty cases of flu that plague you every year. Hot tubs also work the heart. More academics are studying passive heating to investigate its benefits, but the evidence is slowly unfolding: it’s great for health. Research in Finland found that going to the sauna regularly reduces the likelihood of heart attacks in men. Other studies indicate it causes arteries to become more flexible. Soaking in a hot tub increases an individual’s heart rate while lowering their blood pressure. The water’s pressure on your body and the increased rate cause your heart to work harder, giving it a nice cardio exercise. For this reason, people with heart problems are advised to discuss soaking lengths with a doctor. If you’re interested in burning some calories without putting your body through torture, a hot tub is right for you. An hour-long dip in a hot bath results in the same number of calories being burnt as a half-hour long walk. This is due to the rise in body temperature, which consumes energy. A hot-tub soak or power walking across town? The choice is yours, but we have a feeling we know your answer. Research into passive heating also shows a correlation between hot tubs, saunas and warm bathing with blood sugar. A 1999 study demonstrated hot tub therapy’s effectiveness on individuals with type 2 diabetes. After three weeks of therapy, the individuals experienced improved body weight, better control over blood sugar and less dependence on insulin. New investigations believe these results are due to heat shock proteins, which are molecules created by cells in response to stress. Passive heating raises the level of heat shock proteins, which improves blood sugar. Temperature therapy is a go-to for anyone who experiences regular headaches or migraines. The heat from the hot tub’s water can relieve strained muscles, which sometimes cause headaches. These particular kinds are known as tension headaches. They affect one-third of men and half of women in developed countries, making these the most common headache disorder. By relieving the tension in the shoulders and neck, the stress upon the head is reduced. Further, stress headaches are usually associated with high levels of anxiety or emotional pressure. Sitting in a hot tub relaxes the muscles and the mind, resulting in a pain-free head. Even individuals suffering from migraines can experience the benefits of a hot tub. Nearly 1 in 7 people around the globe suffer from migraines, and the best way to get a handle on one is to nip it before it becomes a full-fledged monster. Migraines are reduced or eliminated with calm environments, temperature therapy, adequate sleep and plenty of relaxation. A hot tub offers all of these things. The benefits aren’t limited to your back and head. All aches and pains can find relief in the bubbling isolation of a jacuzzi. One study showed immersing legs in warm water for 45 minutes reduced or eliminated all aches and pains associated with exercise. So if you’ve been on your feet all day at work, this is a great way to alleviate the agony your body experiences. The water’s ability to “hold” you and ease the pressure on joints, the increased blood flow and the warmth all lead to a body that just feels better once you waltz out of the tub. Who doesn’t want to unwind after a long day at work or a stressful week? Your mental health is just as important as your physical body. Balanced social, emotional and psychological states create an overall better lifestyle. They even impact physical health. A 2003 report, for example, found a clear connection between depression and arthritis pain. Those suffering from depression experienced more bodily pain than those who did not. Mental health also leads to improved productivity, financial stability and a longer life. So relaxing in that jacuzzi after a long day isn’t just for your aching feet; it’s also for your peace of mind. And even if you can’t afford a built-in hot tub, inflatable ones like the Intex Hot Tubs have hit the market. It’s a great way to pass time with friends or simply find some quiet after a stressful week. Everyone can enjoy the numerous health benefits of hot tubs. They offer a great means to entertain guests as well as an easy, relaxing night in. 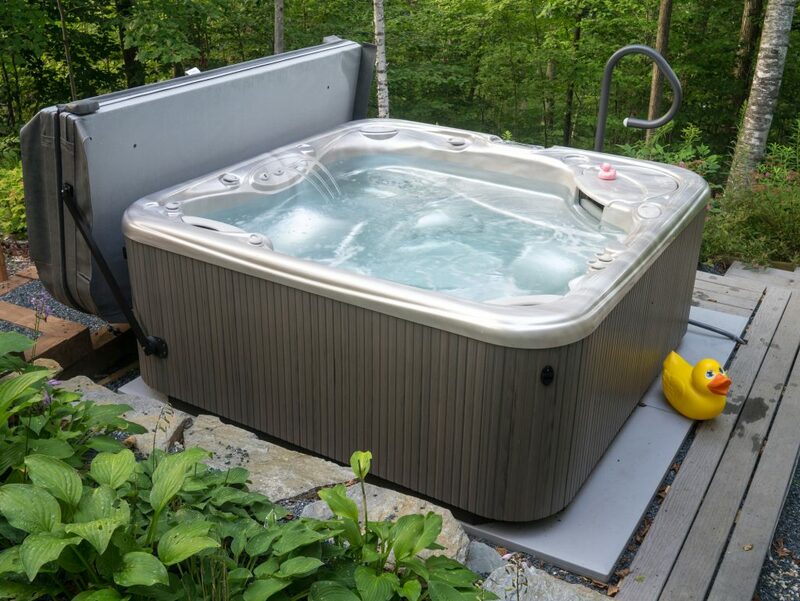 Are you considering purchasing a hot tub? If so, you’ll want to check out our article on inflatable hot tubs. Portable models are great if you don’t want the expense and hassle of a permanent installation. Don’t wait to reap the benefits of this fun and bubbly home addition. If you’re stressed and want in on all the health benefits, a hot tub is most certainly right for you.